On Tuesday, I wrote about the governor of Michigan, Rick Snyder, and his cronies knowingly poisoning the people of the city of Flint with drinking water that contains 16 times the allowable amount of lead. Most tragically, are the 8,500 or so children who have been drinking and bathing in this crap for two years: lead is known to cause irreversible brain damage. Over the course of this last week, I've become increasingly angered and appalled at the state of affairs in a place I once called home, each day discovering some new outrage committed by this governor who deserves the title of genocidal sociopath. (I don't use the term "psychopath" only because his crime seems to be the result of selfish disregard for the lives of others rather than an overt attempt to injure them, a distinction without much of a difference in this case I know.) Competing with the urge to march on the governor's mansion with torches and pitchforks, is a desire to do something for the people of Flint. You would have to send 200 bottles a day, per person, to cover what the average American (we are Americans in Flint) need each day. That's 102,000 citizens times 200 bottles of water -- which equals 20.4 million 16 oz. bottles of water per day, every day, for the next year or two until this problem is fixed (oh, and we'll need to find a landfill in Flint big enough for all those hundreds of millions of plastic water bottles, thus degrading the local environment even further). Anybody want to pony up for that? Because THAT is the reality. This is a catastrophe of unimaginable proportions. There is not a terrorist organization on Earth that has yet to figure out how to poison 100,000 people every day for two years -- and get away with it. That took a Governor who subscribes to an American political ideology hell-bent on widening the income inequality gap and conducting various versions of voter and electoral suppression against people of color and the poor. What he doesn't mention is that over half of all of Michigan's black citizens currently live under the financial thumb of the emergency manager dictators who are, via the governor, to blame for the mass poisoning of Flint. We have now seen the ultimate disastrous consequences of late-20th century, neoconservative, trickle own public policy. That word "trickle," a water-based metaphor, was used to justify this economic theory -- well, it's no longer a metaphor, is it? Because now we're talking about how actual water has been used to institute these twisted economic beliefs in destroying the lives of the black and the poor in Flint, Michigan. (W)hat we need in Flint -- and across the country -- right now, tonight, is a nonviolent army of people who are willing to stand up for this nation, and go to bat for the forgotten of Flint. 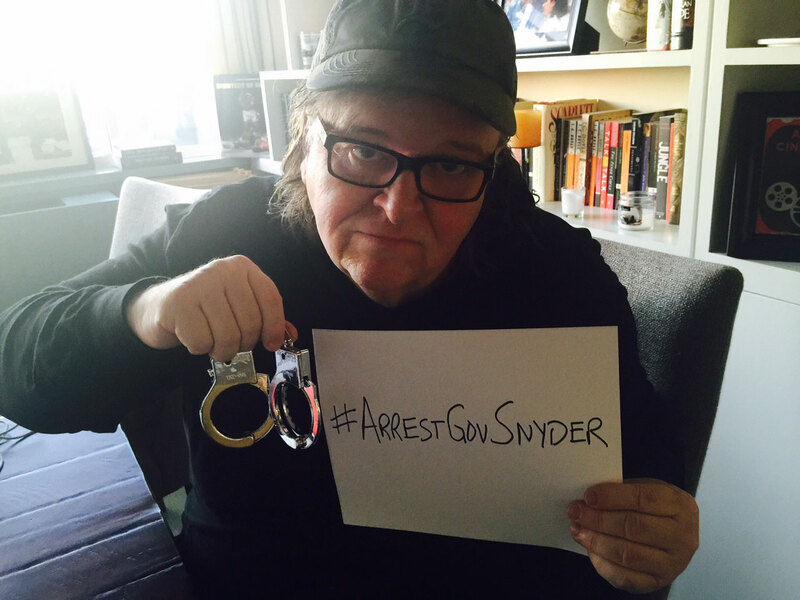 The first thing to do is sign this petition that demands the immediate removal and arrest of Governor Rick Snyder. Then click over to Moore's site and read the full piece which includes a list of other things we can do. And none of them are things that you can do, only things that we can do. Some of you may ask what this has to do with the early childhood education. I'll repeat what I said on Tuesday. This tragedy was caused by the same "American political ideology" that informs the corporate-style education "reform" movement, the one that is destroying our public schools with standardized testing, standardized curricula, school closures, union-busting, and scandal-plagued charter schools, all of which are the educational equivalent of switching our water supply to the Flint River. The only thing that can fix this is democracy and the only way that democracy works is if we the people stand up and make it work. Can't We At Least Stop Hitting Children? "I Wasn't Really Going To Trap You"
"Either We Win Or We Learn"